Grooming your dog helps to remove dead hair from your dog which promotes healthy hair. This helps to reduce any awful odour on your dog. It also helps in circulation to achieve healthier and beautiful coat and at the same time keep the lice off. Doing this makes your dog achieve maximum overall health as a result of having stimulated blood flow. Prevention is always better than cure, so keeping your dog well groomed and clean. It can help to prevent any unwanted visits to the vet! In case your pet has a health issue such as skin disease, hair loss, teeth decay and other problems, it can be easily discovered by our professional groomers during the grooming session. Mobile dog grooming service is suitable for dog owners who don’t have time to bring their dog out for grooming. Therefore you can make use of our dog grooming services. You no longer need to take your dog to the pet salon. 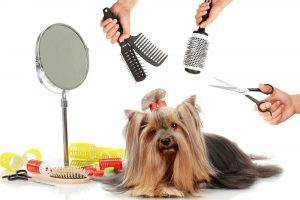 The advantage of using our mobile dog grooming services is the fact that you can save time and hassle of transporting your dog to and from the pet salon. Your dog will not be left in pet salons for the whole day as we will start on the job once we reach your home. Whenever you need our grooming service, just give us a call. Our services are top notch and we provide the best pet grooming services at your convenience. Our certified groomer are professionally trained in handling and styling different breeds of dog. Before the grooming session you can just let us know your preferred style of fur cut. In case you need some ideas, please take a look at the photo gallery of our past grooms to choose a preferred style for your dog.